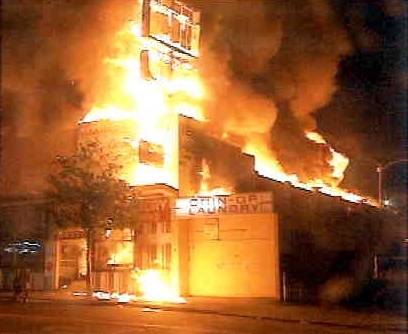 ... 1992 (20 years ago today), in what would prove to be days of rioting broke out in Los Angeles, California. (photo credit) -- the worst the city had seen since the Watts riots of the mid-1960s. Violence erupted after an all-white state court jury acquitted 4 white police officers implicated in the beating of a black man, Rodney King, that was caught on video tape. In a federal civil rights trial the following year, 2 of the 4 police officers were convicted and served 2 years each in prison; they city eventually paid King $3.8 million in damages.